Starting with the cowboy guitars on the early 1930s, old Supertones offered by Sears & Roebuck are fun little guitars for the modern blues player. They are well built, feel comfortable and sound great. 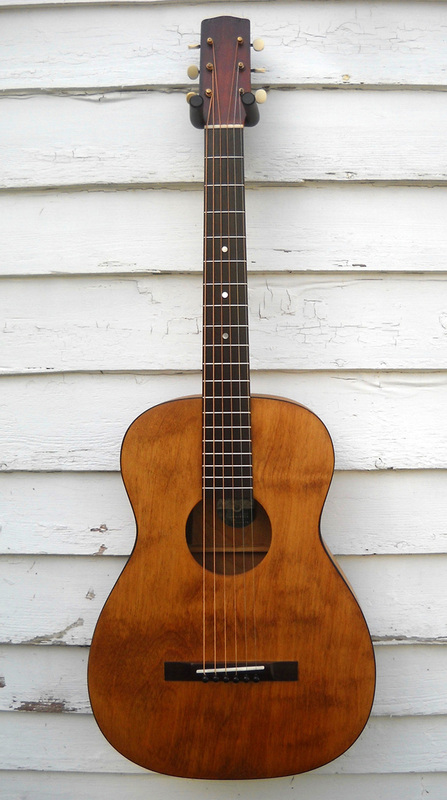 This example retains it original Supertone paper label inside the soundhole. A somewhat chunky neck might discourage the small at hand but otherwise this 80 year old guitar is certainly worth a look for the money. SPECS: 0-size body, 12-fret neck with paddle headstock, ladder-braced top in natural finish, sides and back in natural finish, neck in burst finish, period tuning machines, steel reinforced neck with soft “V” profile, rosewood fretboard with new frets, MOP markers on 5, 7, and 9th frets, bound top and back, rosewood bridge, ebony pins, bone nut and saddle. Nut width: 1 3/4", String Spacing: 2 5/16", Scale length: 24", Upper bout: 9 1/2“, Lower Bout: 13 1/4", Body length: 17 3/4", Widest body depth: 3 5/8", Overall length: 36 1/8" , Neck thickness at 1st fret: 15/16", Neck thickness at 5th fret: 1", Action: 1/8", string gauge setup: custom lights 52-11 gauge standard tuning. CONDITION: Back-off rebuild to convert this old gal into a modern player. Evidence of prior tailpiece and side tear. One top and one back hairline repair. Finish has scuffs, crazing, edge wear, binding has some gouges, wear and shrinkage. Bracing was updated to accommodate modern custom light set string tension. Other work included neckset, new fretboard/frets, bridge and setup. SOUND: This guitar definitely leans toward blues as a musical style. It’s punchy and loud, particularly with a flatpick.